The title of this post pretty much says it all. 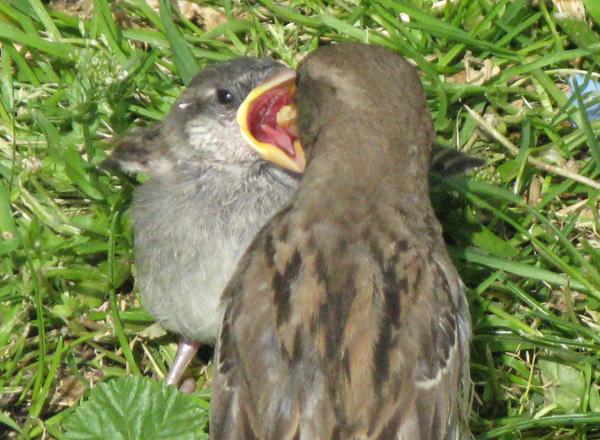 A couple of weeks ago I watched and photographed a young House Sparrow getting fed by its mother. 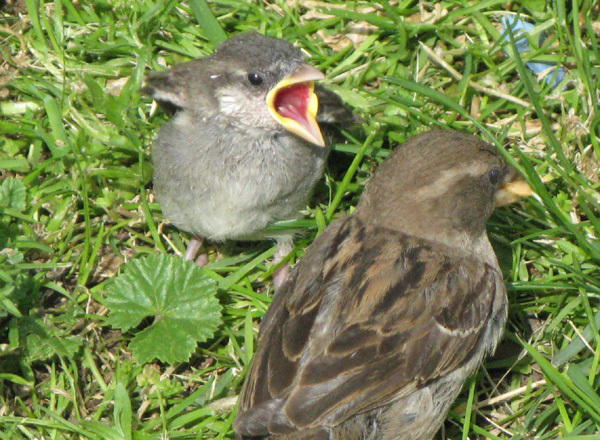 I also watched, but failed to get pictures of, the same young bird being fed by two different male House Sparrows. These particular birds were in Battery Park at the southern tip of Manhattan, but the same story is taking place all over the world right now, as few species have successfully adapted to as many locations as the House Sparrow. Enjoy! Though they are an invasive species here in North America they can still be pretty darn cute, though not as cute as baby raccoons! WOW! So cute, and great picts! Oh how I love them. A house is not a home unless there are a bunch of “sparrers” squabbling over the dust bath on the pavement outside. Do you know, of all the birds that come into my garden, I love the friendliness of the sparrows. I love to take a few minutes, when I can, to just stop and watch them. @Bird: I guess my entire neighborhood (and city) is a home! @Jeanie: I do like to hear them chirping away all day. i got one of these as a fledge, from the cats mouth, it is in good shape, but too young to fly, i guess yesterdays wind gusts knocked him out of his tree. i put him in the bird cage with a bowl of water, a bowl with grit, and a bowl of bird seed i ground to a meal with the back of my kitchen knife. i rescued a jay a fewq years back, but i just put him in a box and nailed it to a tree, his parents where looking for him and they came for him within an hour he jumped out of the box and who knows what happened. this guy has got nobody crying for him and i wonder if i am giving him half a chance. should i be catching worms, chewing them up and spitting them in his mouth, or is ground up pigean seed good enough? he seems scared but when i held him in my hand and stroked the back of his head his eyes closed and he seemed to relax. my neighbor did that and the fledge opened his mouth, seeming to want to eat, but he lives with the cat, so this sparrow thingy is in my charge. he is a week or 2 from really fledging, i think. what can i do to help him? look i don’t really care about wildlife much, but if you have an answer for this little guy, he’d appreciate your help, i’m sure. @yes cute but, It seems unlikely that high winds would have driven a young House Sparrow out of its nest, as they tend to be cavity nesters. Are you certain the bird can’t fly? If it can’t, a varied diet is always better: if you can’t get insect/worm-type protein then raw hamburger can be used instead. No need to regurgitate worms: if the bird is old enough to survive out of the nest it can manage to digest worm chunks. Good luck, and I would recommend letting the bird go as soon as it seems feasible. Hi, I work at a courthouse and yesterday we found a young sparrow on the steps. Someone I work with said it would die if I didn’t take it home and I believed them. I called a bird rescue my vet suggested but they never called back. I looked up what to feed it but it would only lick at the food, it wouldn’t really open it’s mouth. I read many times last night that I should put it back and the parents would feed it. This morning, I let it go in some bushes near where I had found it. The birds I thought were the parents fly near but have not gone to care for it. Will they still care for it even though I had it for approx. 15 hours? I don’t know who to ask and people posting seem to know a lot more than I do. Please help if you can. my cat brought me what I think is a fledgling sparrow it seems to be able to fly somewhat but my darn cat tore out his tail feathers.what could I feed him and how long would it take for his tail feathers to grow back? Are you aware that these are non-native, invasive birds that were brought here from Europe in the mid-1800s. They kill thousands of native birds every year by brutally decapitating the incubating female while she is on her nest. They use their powerful, seed-cracking beaks to kill them and take over the nest. There are hundreds of dedicated ERADICATION programs to control this HORRIBLE, HORRIBLE bird, and I am proudly one of those people who willingly do the “job” of controling them. I will continue as well. They kill of bluebirds, chickadees, titmice and swallows (to name a few) all the time! You really shouldn’t be supporting this terrible cause. Besides, they’re not that pretty anyways! @Bret: Being a non-native alien invasive whose ancestors, I am sure, took part in helping to eradicate the indigenous populations (seeing as I am of European decent), I really don’t feel like I am in any position to criticize the House Sparrow too strongly. And taking pictures of a young bird being fed is not “supporting a terrible cause” as you seem to think. If you had bothered to read the text of the post you would see that I am aware that House Sparrows are not native to North America. I advise you to calm down, take a deep breath, and relax. all ground to a puree in the blender. Cut a drinking straw to resemble a spoon shape and feed those babies ALL THEY WANT. You cannot overfeed them . dont try to force water down their throat as you will drown them! I have been rescuing and releasing birds for many years and know what to feed them. P.S If you have only one bird .it will imprint you and will not do well in the wild. plan on finding a rescue agency or raising single birds. @Bret – I’m in agreement with Corey. I volunteer with wildlife and although some wildlife hospitals do not rehabilitate invasive species, there are controversial opinions and disagreements across the board on this topic. 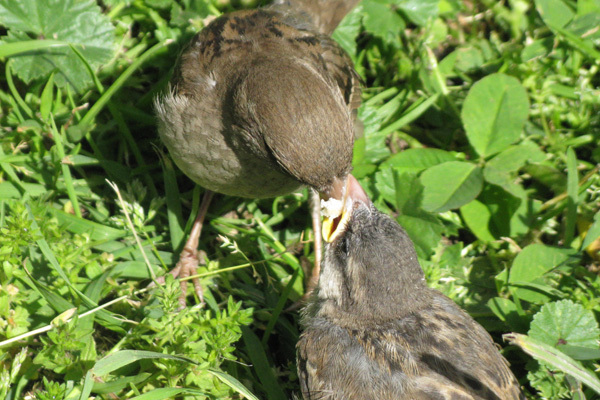 In fact, in Europe, the House Sparrow and Starling both are becoming endangered and actions are being taken to encourage their reproduction and presence. We humans are by far the greatest threat to any bird or wildlife species on this planet — with our voracious appetite for land, development, and goods which decimate the environment for all birds and animals. I find it disingenuous to single out one species of invasive animal when the greatest threat to all of our ecosystem is us. It is also we who mess with the balance of our environments by introducing invasive species either deliberately (for hunting, as an example) or inadvertently. I love birds and have great concern for all native species as well. But I simply cannot abide by the stance you’ve taken toward these birds. It’s deeply lacking in compassion, irrespective of your pragmatic stance on the issue. Beautiful job on the photos! Sorry I’m late viewing them, as I see you posted them awhile back. I love House Sparrows. I rehabilitate orphaned birds and yes, I have encountered the “bird snobs”(or “environmental snob”) who criticize anyone who rehabilitates a House Sparrow. Here is why I disagree with bird snobs: Humans are an invasive species who not only continue to breed unchecked, but also do incredible damage to the environment in countless ways. This includes killing many native species which nest in the fields and when the tractors harvest the crops, the baby birds get killed in the process. Not to mention pesticides (which kill many birds) and those who allow cats outdoors (Cats kill billions of birds each year and they don’t discriminate about what species they kill). When I rescue a bird or animal it is because that creature is suffering, not because there are more or less of that particular species. All creatures suffer the same way, including humans. If someone wants to criticize a non-native species because it is “harmful to the environment”, they need to first stop driving a car (using gas), stop eating all the foods that are harvested (and where animals are killed in the process), stop letting their cat outside, and stop doing many other things first. After all, it was the human species that brought the House Sparrow here in the first place. Enough said. There, I have had my say. Folks, it’s horrific to do anything but kill these creatures. They are incredibly destructive to virtually all North American ecosystems. WE brought them here, and we have a responsibility to ERADICATE them before they wipe out the bluebird, chickadee and downey woodpecker populations. Ditch the sentiment and BE RESPONSIBLE. BTW, since I began an aggressive eradication (HOSP and Starlings) program, the number of native species nesting and visiting our feeder has increased dramatically. There are more species AND more of each visiting our urban feeding station. That’s a win. Don’t let sappy sentiment get in the way of responsible stewardship. @Mark: No, it is not horrific to do anything but kill these creatures. It is horrific to me that anyone would write such a thing. But as soon as you start an eradication program on European-Americans (like me!) I’ll agree wholeheartedly with you on your bird-eradicating project. Still so gung-ho about wiping out invasive or introduced birds? Obviously starlings and House Sparrows damage some North American ecosystems but hyperbolic phrasing like yours does not help your cause. The fact is no eradication effort on these species will work beyond the local and short-term. Since you are a biology major, then you are also aware of the inexact science and the questionable claims surrounding the actual damage done by these birds with respect to other species. There was a study which showed Starlings did NOT have the impact on other birds previously thought. I wrote this earlier in this thread, and continue to agree with Corey (and with Ellen) that we are, by far, inflicting the most damage on native species. And yet we’re reticent — even, at times, violently opposed — to having a public discussion on population (and its attendant pollution and development) and how it affects other animals. Instead, we continue on this path of stamping out the little flames with misguided culling policies which, as Corey states, will never solve the problem of the big fire. The real problem exists on the more fundamental level of us humans decimating habitat in such a way that even native species often cannot thrive, absent non-natives. I agree with Corey that if we, as a society, nation or even globe, were to begin discussions that included our own culpability in these matters, I’d be much more open to hearing points of view such as those presented by Bret and Mark — as potentially part of the larger plan. As it stands today, we’re engaged in fruitless and often cruel endeavors to put bandaids on a mortal wound. And arguments like Bret’s and Marks amount to a vendetta against a straw bird (as it were). I live out on a 400 acre ranch that is and always will be preserved so that no building will ever take place. I am fortunate enough to have bluebirds present on the property, so I took advantage of this and decide to increase their population! Becuase I do not have to worry about development taking away the bird’s natural habitat, it is not an issue on my own private nest box trail of 50 boxes. However, in order to take precautions I trap and humanely dispatch the starlings and house sparrows and always will. I personally do not like either of these birds because they are obnoxious and ugly in MY OPINION. Do not make me repeat this, okay? Do what you want with your bird populations. I choose to have the birds that belong here rather than the non-native winged rats that you seem to be defending. I will do what I please on my property and for starters, guess what? It is not only LEGAL to kill these birds, but encouraged. I may be a biology major, but I’m no tree-hugger. I do what I believe is right in order to protect the beautiful bluebirds that I so love! Also, over spring, I trapped 30 starlings and the Acorn Woodpecker population exploded! SO nice to see, don’t you think? Oh, nonsense, Monica. The damage that non-natives do is observable. It’s a manmade problem and it’s our responsibility to ameliorate it, if at all possible. You can SEE the benefits of a sparrow eradication program. Right now. One season. If you don’t do it when you have the pests, there WILL be fewer other species. It’s a biological nightmare. You’ve got a chance to save bluebird, and cliff swallow, and Purple Martin, and chickadee populations from extinction. We can talk about ecosystems, but frankly for a lot of these birds, that’s an EASY problem to solve. Sparrows are NOT. In my little urban neighborhood, my neighbors have commented upon how many birds there now are. Feeding and seed gardens bring them in, and the lack of sparrows let them breed. We aren’t talking about the inconvenience of a little sparrow poop, we’re talking about devastation of biodiversity. But fine, if you like a little monoculture of sparrows and starlings in your cities, you have at it, but don’t pretend that you’re a responsible steward of our natural resources. I disagree. All it takes is a concerted effort. If I alone can suppress a neighborhood’s sparrow population, what can an educated populace with the moral will do? It’s not hard to trap and shoot sparrows. The rewards are huge. Will we totally eradicate them? No, but we don’t have to. All we have to do is suppress their numbers and maintain. Or you can give up. If you’re going to give up, well, then, might as well bring back DDT and get rid of song bird protections, too. Hey Mark! I use Blaine Johnson’s deluxe repeating sparrow trap and the Van Ert nest box trap, that way, I cover both grounds! What do you use to get rid of the winged-rats? @Mark and Bret: I think you guys miss the point here entirely. 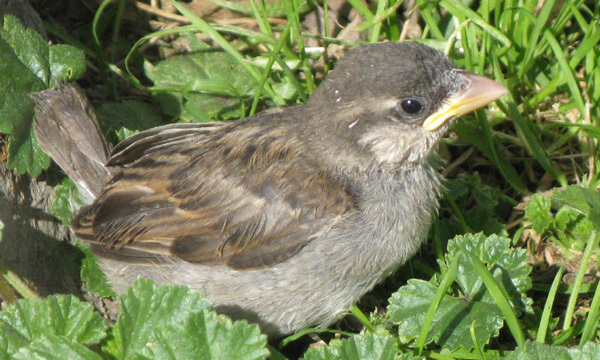 This post was some cute pictures of a fledgling House Sparrow. That is all. Then both of you came and commented…first Bret, who initially had not even bothered to read the text and then Mark with absurdly hyperbolic and insulting statements. Bret, I find it great that you are doing what you do on your ranch. I don’t care though. No one is saying you can’t have an opinion or do what you want on your ranch. On this blog, though, we get to decide what comments stay and what comments go. And now that you have decided to start talking about what tools you use to kill birds you have worn out your welcome. Mark, the fact that you could say something like “We can talk about ecosystems, but frankly for a lot of these birds, that’s an EASY problem to solve. Sparrows are NOT” blows my mind. Really, resolving habitat loss and unravelling ecosystems is easy? By all means, I would love to hear how that is so. Also, not killing sparrows is hardly equal to bringing back DDT and getting rid of song bird protections. Since both Mark and Bret seem unable to be polite guests (polite guests do not gratuitously insult their host) on this blog I have decided to close comments on this post.